Sticking Viva Vegan on my Christmas list was a bit out of left field, but it has turned out to be fantastic. The recipes are really delicious Latin American staples with great Vegan twists, and there are some really interesting meat-substitutes that I can’t wait to try – and I’m sure I’ll get to soon. As a bonus, most of the recipes can be made from store-cupboard ingredients – albeit pretty specialised store cupboard ingredients! As I’ve embarked on a recent on-again, off-again love affair with the VB6: Vegan Before 6 diet I have found myself making the recipes more often, and I’m definitely developing some favourites. Our top recipes so far are the Cashew Crema – a replacement for the ever-present sour cream used in many recipes – and the Drunken Beans, although we have yet to make the Vegan Seitan Chorizo, which I am really looking forward to. Making Seitan is one of the things we just haven’t tried yet from the book – it took me a while to source the Vital Wheat Gluten, which is essential to the recipe – none of our local health food shops had it, so I had to resort to Amazon. While I was there I stocked up on some of the more unusual ingredients she mentions – I’ve listed them below to make it easy for you to find them. Any day know I’m going to get the time – and courage – to give it a go, and then I’ll report back . . . This is a quick, simple sauce which makes an easy addition to steamed veg-and-rice. Loved by all the family. Slightly less well received by the whole family, but one of my favourites. We’d use it more if you didn’t need to soak the cashews beforehand, as we’re always after creme fraiche. I do this one all the time – albeit without the Seitan Chorizo, as I’ve only just got the Vital Wheat Gluten. Some point soon I’ll do the whole thing – it should be even more delicious. Used in lots of vegan dishes – this is a meat substitute based on Vital Wheat Gluten. Getting the ingredients was the hard bit. Now I just need to find time to try making it. Crispy-fried tortillas stacked with toppings – what’s not to like? I’d just love to see the kids’ faces when we serve them something covered in chocolate . . . These could be perfect for a VB6 vegan breakfast – and a perfect alternative to Bacon & Eggs! And there are plenty more where those came from. – Vital Wheat Gluten Flour , essential to make Seitan – the delicious meat substitute. – Liquid Smoke , for adding that essential barbecue flavour to Seitan. – Engevita Yeast Flakes for more meaty flavour. That’s the update – even if you are a dyed-in-the-wool carnivore there are some great dishes for you to try! We’ve got far too many cookbooks, but there’s always room for one that changes everything! We know we need to eat less meat, but never seem to get around to it . . .
Sticking Viva Vegan on my Christmas list was a bit out of left field, but it has turned out to be fantastic. The recipes are really delicious Latin American staples with great Vegan twists, and there are some really interesting meat-substitutes that I can’t wait to try. As a bonus, most of the recipes can be made from store-cupboard ingredients – perfect for our collection of Resilient Recipes. Now all that’s standing between me and some Seitan Chorizo sausages is finding some Vital Wheat Gluten! I’ve got some Black Beans and Cashews soaking now for tomorrow’s dinner – I’ll let you know how we go. I got it from Amazon, so if you can’t find it locally, here is the link –Viva Vegan , and the Trafford Eco House will get some money from your purchase (it won’t cost you any more). Turkish flat bread or some long-life wraps. Drain and rinse the chickpeas, then combine the all the ingredients in a food processor, with a stick blender (we use a basic one like this – Kenwood Stick Blender , or you can manually mash them if you’re desperate! Add extra lemon juice, water or olive oil to taste, and if it dries out just add a little more oil. That’s it – easy, quick, and delicious. Mix the flour, yeast and salt in a large mixing bowl. Add the water, bit by bit, mixing the dough with a spoon – not too slowly or you end up with an impenetrable ball of dough that shrugs off any more water. Keep adding water until you have a very soft and almost sloppy dough. Cover the bowl with a tea towel and put in a warm place to rise for an hour – our kitchen is usually warm enough. Meanwhile, pre-heat the oven to 250°c and put a large baking tray in it to heat up. When the dough has risen, remove the hot tray from the oven and sprinkle with a little flour. Scrape the dough out of the bowl and straight onto the tray (it’ll be too soft to handle) and gently press into shape. 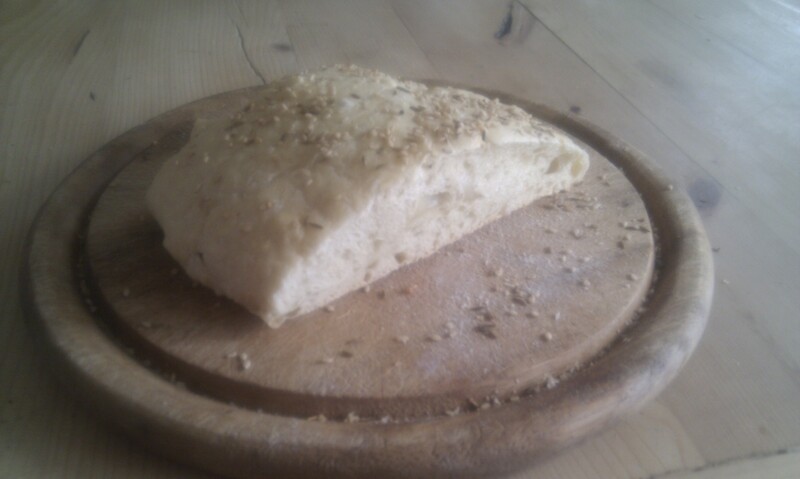 Quickly spray or brush the loaf with a mixture of cold water and a dash of olive oil then sprinkle with the seeds. Bake in the middle of the oven for 12 mins, then remove from the oven and brush/spray once more. Bake for a further 5 -8 mins, or until the bread is golden. If you want a crusty loaf then cool it on a wire rack, but for the genuine Turkish Flatbread soft crust, wrap it in a teatowel. 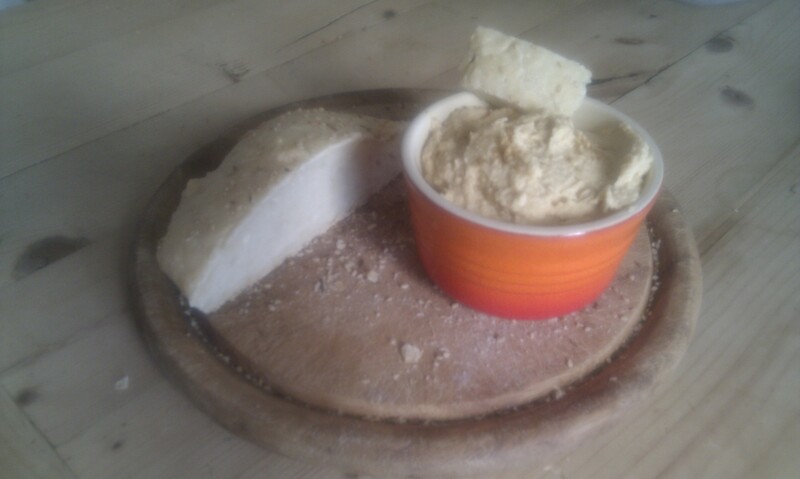 We love eating it as toasted sandwiches, but it’s also great with our home-made hummus. This recipe comes from our new Resilient Recipes project, which was inspired by Sharon Astyk‘s book “Independence Days: A Guide to Sustainable Food Storage and Preservation “. It aims to lay out a range of easy, delicious meals that can be made from pantry ingredients in combination with home-grown veg. The best of these recipes will need little or no cooking, should appeal to all the family, and can be easy everyday meals made from ingredients that can be stored for up to a year. In the event of any form of disruption to the food supply a well prepared family will be able to feed themselves happily from the Resilient Recipes guide. We’ll start filling it with our favourite resilient recipes, feel free to contact us with yours and we’ll try them out and add them too! Mix and match – add one or more of these. Reduce the quantities if you add more than one. Heat the oil in a large pan with a lid (we use a non-stick wok with a lid ). Add the onion, garlic and any extras you want, other than the porcini mushrooms. Fry, stirring, for about 5 minutes. Add the rice, stock, wine, passata, herbs and porcini mushrooms and bring to the boil. Cover, and cook gently for 25 minutes until the liquid is absorbed and the rice is just tender. Remove from the heat, stir in the olives and sun-dried tomatoes, and serve sprinkled with the parmesan. Trim and discard woody ends from mushrooms. In a food processor, finely chop mushroom caps and stems. Melt butter in a medium skillet. Add mushrooms and garlic and saute for at least 5 minutes. Stir in thyme, pepper and salt. Chop parsley in food processor. Add hazelnuts and process. Add Neufchatel cheese and process until smooth. Add sherry and mushroom mixture, and process until well-mixed. Spread or mold in serving dish. Cover and chill for at least 1 hour. Serve with crackers. Yields 1 cup. Other mushrooms can be substituted for or combined with Shiitake. Isn’t that just the perfect use for all my nice garden produce? (not sure how to grow a Sherry tree yet though 🙂 ) It’s a recipe from Growing Gourmet and Medicinal Mushrooms by Paul Stamets – which is definitely on my to-buy list.